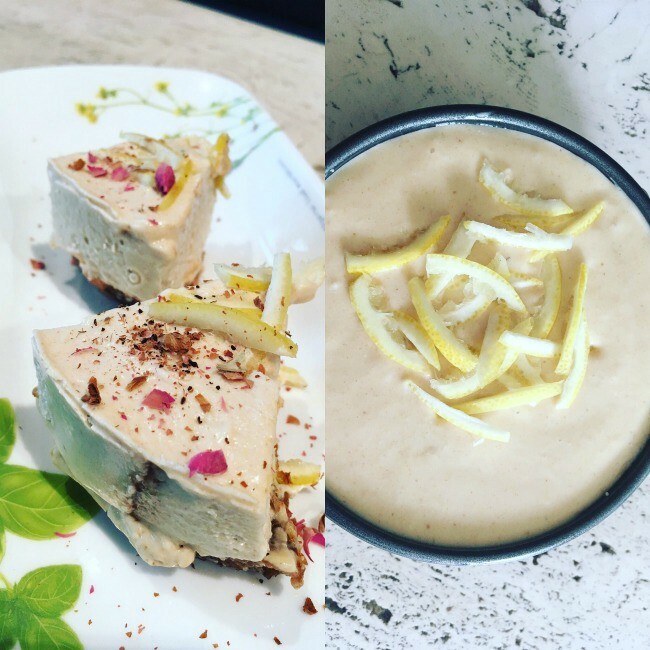 In all honesty, the origin of this Raw Coconut Lemon Icecream Cake is simply that I wanted to make a really good lemon meringue pie that is healthy with minimal ingredients — something I can just use straight from the refrigerator. I try to limit the amount of coconut oil and nuts in this cake since the succulent coconut meat itself is already quite fatty, even though the fat is actually good fat. These fats can actually speed up your metabolism, enhance athletic performance, and in turn boost weight loss. The saturated fats found in coconut are mainly short and medium chain fatty acids (MCT), which are usually not stored by the body as fats, but have been found to provide instant energy to the body, without putting much strain on the digestive system and boosting energy to accelerate healing. That being said, I still want to make sure I don’t have too much fat so I only used 1 tablespoon of coconut oil and a few cashews in this recipe. The filling is soft — I didn’t use irish moss in this recipe as I’m lazy. But irish moss and more cashews will give the filling firmer, and adding these ingredients will make the cake hold longer in room temperature. But if you want an easy icecream cake, this recipe will suffice. The filling is made of coconut meat, lemon juice, coconut nectar, cashew, and the chewy base is made of dates, macadamia nuts, Himalayan salt, and mesquite powder. The filling, coupled with the crust, is so delicious that I spooned the cake right from the mould. Yes, this cake is raw, vegan, and paleo-friendly. Chop the dates. Place them into food processor with rest of the crust ingredients. Process ingredients until nuts are broken down and mixture is consistent. Process until mixture starts to rise on sides of food processor bowl. The mixture should be “doughy” and held together. Press crust to bottom of cake tin and lightly press by hand until mixture is spread evenly. Add lemon zest and rose petals on top of cake. Leave to set in freezer for 3 hours or refrigerator for 18 hours. Enjoy! Originally published at nicolelana.com on March 24, 2017.